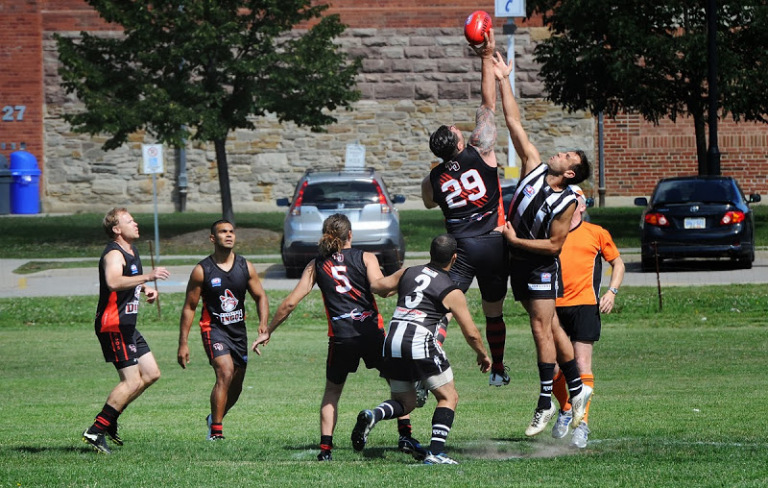 The Division 2 Dingos remain undefeated with a 15 point victory against a determined Rebels side during their round 10 clash last Saturday at Humber South. Things started well for the Dingos with a goal in the first two minutes of the game but was short lived when the Rebels equalized almost immediately after ball up. This pattern continued for the Dingos as a few defensive mistakes were exploited. Thankfully the Red and Black had enough offensive strengths with Ben Kavanagh topping the board with four excellent goals. Supporting him was Dingos Legend Paul Tinkler who, in spite of kicking a goal, was a constant menace to the youthful Rebel back line. Ryan Cross continued his good form with a solid display at half forward and was unfortunate not to bag a few goals himself. The Dingos midfield had a different complexion this week, most notably with Jim ‘The Destroyer’ Sheehan taking up ruckman duties. Sheehan was dominating in the ruck as he fed each tap to a cast of rovers who worked tirelessly all game long. The skipper, Alvin Ranchhod, wily veteran Mick McFarlane and Mick "The Moustache" Densworth were ravenous in the guts as they picked apart the Rebels in each quarter. Supporting them on the flanks were rookies Robert Fitzhugh and Roman Belli ; both made an excellent account of themselves. Birthday boy Belli dished out a series of crunching tackles and bumps and was unfortunate not to score a goal in the last quarter. Joining the Dingos for the first time was Tom Evans who’s pace and skill cut through the Rebels half back line multiple times. He kicked a goal in the 2ndquarter. The backline fought hard all the way through the game and only conceded five goals. This was mostly down to last quarter personnel changes as the Dingos struggled to contain a last ditch attempt by the Rebels to salvage the game. At the heart of this defense was full back Stephen Gordon who put in an excellent display of spoils and tackles which shut down most of what the Rebels could throw at him. Tim Simpson made life hard for the Rebels’ forwards. The rest of the back line put on a competent display with notable performances from Steve Lanning and Drew Bremner. Luke Coonan also contributed well on his debut for the Div 2 Dingos.